Mention the two simple words ‘Star Wars’ to anyone in their early 30s and you will probably observe a Ready Brek-style glow of nostalgia descend on them as they are instantly transported back to a more innocent age- childhood in the 1980s- when the release of a new Star Wars toy figure was a genuinely exciting event. Quite simply, George Lucas’ three original Star Wars films indelibly marked a generation and established a cultural phenomenon that everyone could relate to and share. I use the word ‘original’ because for these adults this is what Star Wars was (and is). Like me, I’ll bet they still can’t get used to people referring to the first film (released in 1977) as ‘Episode IV’. Also like me, I’m willing to bet that they could not have foreseen that the initial three films (Star Wars (1977), The Empire Strikes Back (1980) and Return Of The Jedi(1983) would lead to three prequels in the 1990s. Fans of the original three films collected the plastic figures, the spaceships and wealth of merchandise that seemed to be everywhere back then, but the keenly anticipated DVD release of these films back in 2004 as a ‘special edition’ boxed set caused some consternation. The leading reason for this was George Lucas’ return to the films and his ‘tinkering’ with certain effects to bring them up to date, the results causing a curious sense of misgiving in those who remembered the films’ original theatrical release. The upshot of the 2004 release was an even greater anticipation of a “proper” DVD release of the films as those who saw them originally remembered them. Happily, in 2006, this event came to pass. The wheel has now turned full circle, and those who (like me) experienced a cinematic revelation they will never forget many, many years ago have a chance to do so once more. So, where does The Making Of Star Wars fit into all this? Quite simply, very effortlessly, for it is ‘the definitive story behind the original film’- Star Wars, released in 1977. Using interviews conducted in the 1970s with those who witnessed the unfolding of one of the greatest films ever made, J.W. Rinzler weaves a fascinating narrative which adds additional interest to an already absorbing film and easily supports his own contention that ‘the landscape of cinema in the 1970s simply had no other film like it- and the world would never be the same’ (p.292). The importance of certain cultural products can sometimes be overstated, but not in this case.Star Wars was, quite simply, the definition of a generation- it became their point of reference and its mystical, timeless quality will stay with all those who saw it at a young age forever. Avoiding the familiar trap of taking the reader on a voyage through the already well-documented childhood life of Star Wars creator George Lucas, Rinzler instead picks up Lucas’ cinematic background in the late 1960s and explains how that sowed the seeds for the creation of Star Wars in the following decade. One of the many fascinating things about the book is that it reveals the inspirations behind the many ingredients that ultimately made Star Wars so successful. An example of this is the way the robot C3-PO was influenced by both Metropolis(1927) and The Day The Earth Stood Still (1951)- this parallel is enforced by using stills/posters from those films side-by-side with Lucas’ original drawings for the friendly robot in Star Wars. The book continues in the same vein to explore and discuss the pre-production that went into creating the spaceships, costumes and sets- the mixture of previously unseen original production stills, drawings, sketches and a lively, informative text generates a palpable feeling of anticipation and excitement as the start of the actual filming draws near. Another asset of the book is Rinzler’s well-structured chronological approach, making him able to chart key directorial decisions made throughout the filmmaking process. One such example is the transition made in the main character from a female called ‘Luke Starkiller’ to a male character named ‘Luke Skywalker’. Such key details are then supplemented by items such as the auditions gallery which poses some intriguing questions as to the nature of the finished film if different actors had been finally chosen for the key roles. Once the filming is underway, an additional ingredient is able to be put into the mix- the candid still. Taken during the production, these on-set unposed photographs reveal the family-style nature of the whole cast and crew whilst providing the enthusiast with some wonderful images not from the film itself but from its making. One such example is Alec Guinness’ 62nd birthday, which is marked in The Making of Star Wars by a superb candid photograph of George Lucas, Mark Hamill and Gary Kurtz toasting Guinness’ health whilst a birthday cake is clearly visible in the foreground. Another picture later in the book shows George Lucas in casual clothes) explaining the next scene to Chewbacca (in costume) who simply towers over the director. It is the inclusion of this type of image- catching the incidental details that are all part of the cinematic process- which makes Rintzler’s book so compelling, for he presents an opportunity to both become part of the production yet also reflect upon it. Charting such a monumental film from conception to realisation can not have been an easy task, but J.W. Rinzler makes it appear one. To accompany a text that is forever informative without being dry the author uses a wide mixture of contextual stills (from posters, magazines and so on), stills from the finished Star Wars film, behind the scenes (candid) stills, drawings/sketches, draft script extracts and more- all weaving into a tapestry that helps round out a picture of how one 1977 film changed film history forever. Nor does Rinzler stop at the end of the actual shooting- his book includes post-production information before an extensive section featuring storyboard pictures by Alex Tavoularis, Ivor Beddoes and Joe Johnston which are a fascinating supplement to the existing film as we know it. A thorough bibliographic section rounds off what is an exceptional piece of work lavishly illustrated throughout with high quality monochrome and colour pictures. The appeal of a book such as this should be a wide one: it could act as a reminder of exactly how complicated film production can be, a reference to the film 30-somethings still think of as ‘Part One’ or simply as a visual reminder of how great George Lucas’ film really is. The Making of Star Wars is about more than the making of a mere film however, it is about the making of a whole generation, and, as such, deserves a place on the bookshelf of anyone who loved- and continues to love- the original Star Wars film released three decades ago. 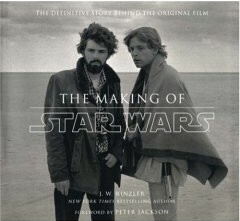 'The Making of Star Wars' is published by Ebury Press.